Creamy, crunchy and fresh, Ina Garten's recipe for Chicken Salad Veronique is delicious. The crunch comes from both celery and grapes. Did you know 'Veronique' in the name of a recipe implies that grapes are one of the ingredients? Bake, chop, and mix - that's it. The hardest part of the recipe was searching the aisles of Walmart for tarragon (and after 10 minutes of searching, I still didn't find it). If you don't have tarragon, do what I did -- use dill. Instead of using the four split skin-on chicken breasts, I used plain skinless chicken breasts and it worked just fine. Place the chicken breasts, skin side up, on a sheet pan and rub them with olive oil. Sprinkle generously with salt and pepper. Roast for 35 to 40 minutes, until the chicken is cooked through. Set aside until cool. When the chicken is cool, remove the meat from the bones and discard the skin and bones. Cut the chicken into a 3/4-inch dice. 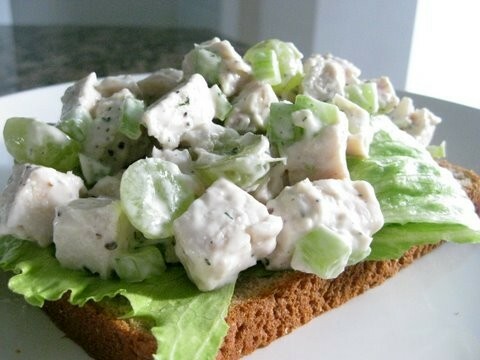 Place the chicken in a bowl; add the mayonnaise, tarragon leaves, celery, grapes, 1 1/2 to 2 teaspoons salt, and 1 teaspoon pepper and toss well.